I recently need to create a new conversion exit to perform additional data formatting on data that were given to my program on input. I learned few interesting things while working on it. First of all the conversion exit can’t be just one. Is it is input/output type of thing a system forces you to create two function modules. One for input conversion and other one for output. There is function module called RS_CONVEXIT_EXISTS which existence of the two. Conversion exits can only be used in the ABAP code as long the two exits. If only one exists system will throw error message that conversion exits doesn’t exist. Secondly there is a fixed naming conversion belonging to the names of the conversion exits. The input one must be called like: 'CONVERSION_EXIT_<>_INPUT' and output one 'CONVERSION_EXIT_<>_OUTPUT'. Prefix ('CONVERSION_EXIT_') and postfix ('_INPUT' and '_OUTPUT') must be given to the function module that will be performing the conversion. Thirdly all the conversion exits are stored in table FUNCNAME among the rest of the function modules. Fifthly name that you insert after the prefix and before the postfix can have up to 5 characters. E.g. CONVERSION_EXIT_MADJ1_INPUT. Sixthly the conversion exits can be used in BW to populate a date for infoobjects. E.g. in case you need to prefill certain value as a constant while data is being loaded to PSA. There is actually a limit for number of function modules that can be included in one function group. I wasn’t aware of this until recently when I ran into the limit. You attempted to add a function module to a function group that is already full. A function group can contain a maximum of 99 function modules. Create a new function group or reorganize the existing one. Pretty much is says that there is a technical restriction of how many function modules can be stored in the group. There is no really solution just to use another function group. Just last note in here the new function modules are created by another function module called RS_FUNCTIONMODULE_INSERT. Year 2018 started a bit crazy when it comes to computer security. Security researches published a huge security vulnerabilities related to CPUs – computer’s microprocessors. If you remember year 2015 and a bug called Heartbleed that was almost nothing comparing to these two. The two are considered as "catastrophic" by security analysts. In short the Meltdown allows a rogue process to read any kernel memory, also in case the process is not authorized to do so. The Spectre is abusing a branch prediction of microprocessor’s cache that affects microprocessors with speculative execution. This involves cashed data which may be read/modified by tricking the accept requests. One of the issues related to these vulnerabilities is that the Spectre is not easy to be fixed. Also while employing the fixes it is causing CPU’s performance degradation. The vulnerabilities are affecting wide variety of devices - almost every device using microprocessors especially made by Intel, ARM, possibly also AMD. As SAP systems are running on these processors as well the SAP is paying an attention to the vulnerabilities. There are special SAP Notes (see below) prepared and being updated that advise customers on what to do. 2585591 - How to protect against speculative execution vulnerabilities on Windows? 2586312 - Linux: How to protect against speculative execution vulnerabilities? Different version of BEx query in runtime vs design time? After query changes done in BEx Query Designer it may happen then these changes are not reflected in the frontend tools like BEx Analyzer or Analysis for Office. Buffering of BW tables is to be blamed for these types of issues. 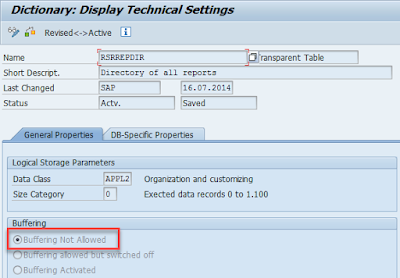 In particular it is important that table RSRREPDIR - Directory of all reports is not buffered. In some BEx versions the table was setup in way that it was buffered. In case there are more application servers in the BW system landscape then the other server which wasn’t used by the BEx Query Designer is reading the query definition from buffer which is not up2date. Either the table is or is not buffered it can be checked in tcode SE11 -> Technical Settings -> Buffering. Correct setting here is “Buffering not allowed”. Similarly in case of running BI frontend tool like BEx Analyzer or Analysis for Office on server with more than one application server there can be different results provided by the frontend tool. Again this can be due to table buffering. 964390 - Different application Server shows different query result. Within process chains there a particular process that can delete overlapping request from cubes. It is useful to use it case of scenarios where same data is being reloaded and staying same request in the cube would cause double data in reports. While adding this process into the chain couple of settings need to be specified. What is crucial is to provide selection criteria for the request(s) to be deleted. 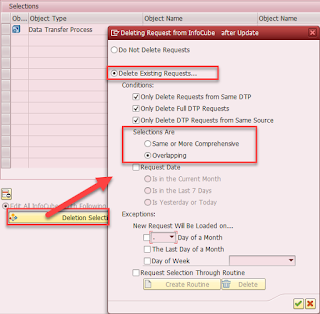 There are two options on how to setup the request deletion in this process based on selection. Only delete if same/comprehensive selection conditions apply. 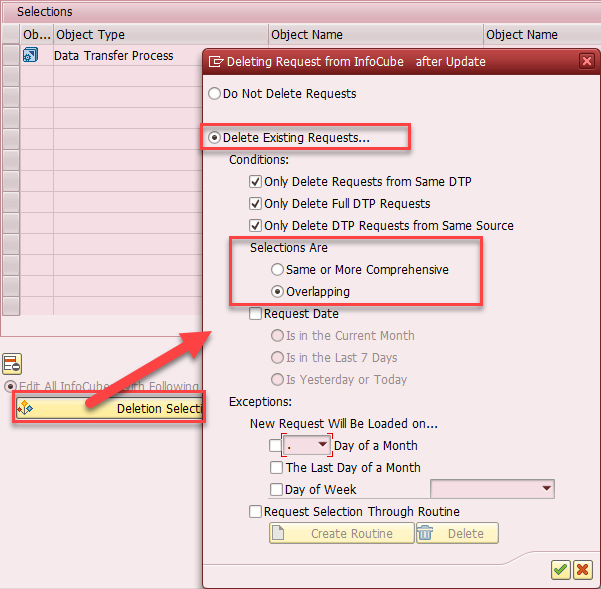 If you set this indicator, requests are only deleted from the InfoCube if the selection conditions of the new request are the same as or more comprehensive than the selection conditions of the request to be deleted. 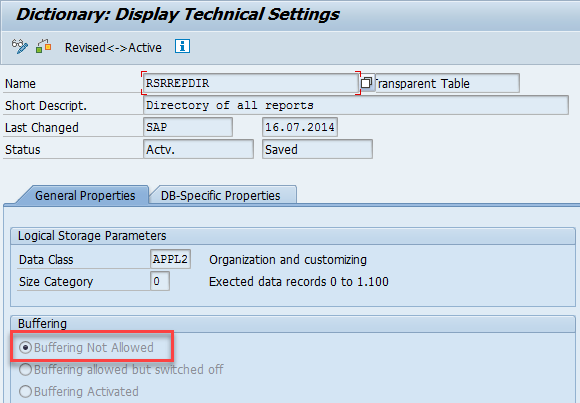 If you set this indicator, existing requests are also deleted from the InfoCube if the selection criteria of the new request partially or wholly overlap the selection criteria of the request to be deleted. Basically difference between the two is 1st case (SAME) the request that shall be deleted must be the same as the one loaded this is also with regards to number of loaded records. Whereas in 2nd case not all criteria need to match is it is less restrictive than 1st case.